Why use databanks in tests? The test runner simulates test events using hard-coded parameter values, that is, the values that you entered during the web test recording or editing. 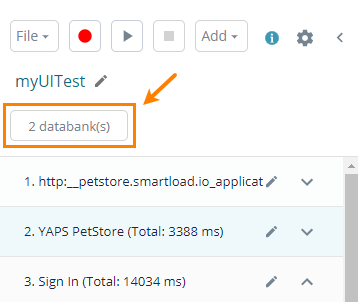 To get larger coverage and check how your web application works with different input values, run your test using varying data – for example, record a number of web tests each entering different data. An easier solution, however, is to use some file as a data source (or databank), read it row by row, and run test commands for each row in that databank. Such tests are called data-driven load tests. The databank must be a CSV or TXT file, with either commas or tabs as a value delimiter. The first line may contain column headers. 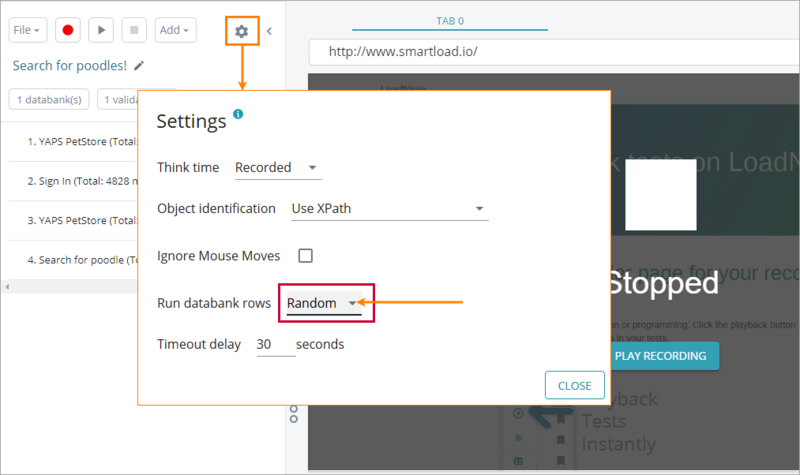 To create a data-driven load test in LoadNinja, attach databanks to individual web tests that your load scenario will run. Then, map databank columns to event parameters as explained below. LoadNinja supports this type of parameterization for the Keyboard Input events, Select Input events, and web page URLs. Random Default value. LoadNinja will pick random data rows from the databank for each iteration and each virtual user. During the test run, there is a possibility that multiple users will use the same data at the same time. Depending on the number of iterations and the number of rows, some rows are used more or less frequently than others. If the number of iterations is significantly larger than the number of rows, each row will be used approximately the same number of times. Sequential For each virtual user, LoadNinja will pick data sequentially for each iteration, that is, the first iteration of a virtual user will use the first databank row, the second iteration will use the second databank row, and so on. Each virtual user processes the databank on its own, so it means that multiple virtual users may be using the same data at the same time. Unique At any given time instance, LoadNinja will pick unique data rows for virtual users, so they will never use the same data at the same time. The number of databank rows should be equal to or greater than the number of virtual users that will run this web test. Create a .csv or .txt file with the desired data, using either commas or tabs as value delimiters. Use any text editor to create the file. Many spreadsheet applications such as Microsoft Excel, Numbers, and LibreOffice Calc also export data to CSV. Tip: We recommend that the first line contains descriptive column headers. In this case, the test will display the column names rather than indexes (1, 2, …). If you do not have a test yet, record it. Replay the recorded test once to make sure it works correctly. Click Browse and select one or multiple .csv or .txt files from your device you want to use as databanks. To remove the file you have accidentally added from the list, click near that file. Click Next: Define File Format to proceed. In First row contains, specify whether the first row of each file you have attached should be treated as a header or a data row. In the Column delimiter column, select the symbol that separates columns within your databank. Click Next: Review Import. LoadNinja will try reading data from your files. LoadNinja will display a preview of the data. If the data does not look right, click Back and change the parsing settings. If LoadNinja loaded data correctly, go to the next page by clicking Next: Map Data to Script. On the next page, map column values to test commands in your web test. LoadNinja will locate parameters within the test and list them. Select a file you want to use as the databank in the Map file column for a parameter. Select the databank column from which the input values will be taken during the playback. In both these cases, select No Mapping to skip this setting and use the hard-coded recorded value during the playback. Tip: To change these mappings later, simply click Upload Databank in the script recorder. To learn how to map values in the web test editor, see below. Note: Databanks are not shared among web tests. To use the same databank in another test, attach it to that test separately. To change the databank columns used for events, use the Modify Databank command or edit the event parameters directly. Click Modify Databank on the toolbar. Update the mappings as required and click Save. Currently, LoadNinja supports this feature only for Keyboard Input events. For parameterizing URLs and selection inputs, consider creating a mapping while uploading a databank. In the list of test steps, find the Keyboard Input event you want to parameterize. 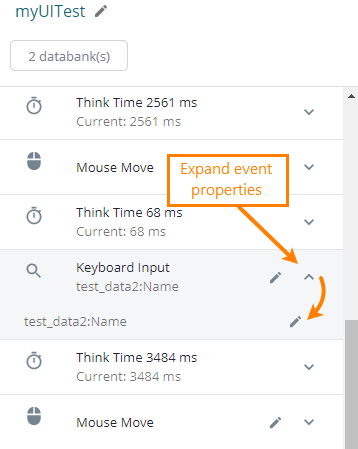 Expand the event parameters and click . Select or unselect the Use Dataset check box as required. If Use Databank is selected, select the databank column to take the parameter value from. (Optional) Remove the obsolete databanks by clicking near them. Browse for the new databank and click Next: Define File Format. Configure the importing settings, as you do for the new databanks. If the new databank has a different set of columns, update the event-to-column mappings as required. 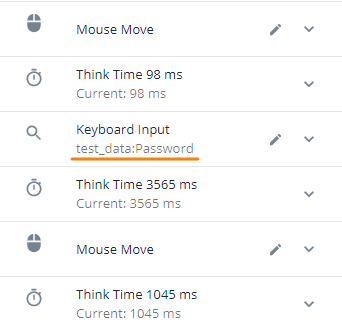 When you attach a databank to a web test, LoadNinja updates the Mocha code of this test accordingly. While it is not possible to edit the Mocha code in LoadNinja directly, knowledge of databank-related statements can be helpful if you wish to reuse this code in external testing tools. The databank is put into an array. The array name (DS_test_data in the example below) consists of the DS_ prefix followed by the name (without extension) of the databank file. Array items correspond to the databank rows. Each array item is an object where the keys are column names and the values are column values. If the databank file does not include column names, LoadNinja uses numbers as column names: "1", "2", and so on. The code then picks a random row number to be used during the test. Here, 10 is the total number of databank rows; your databanks may have a different number of rows. 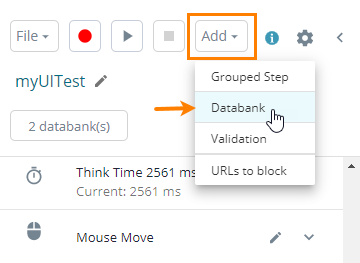 Test events that are connected to the databank will use the values from the specified data row. Here, "Name" is the databank column mapped to this event.